Bali Kecak and Fire Dance Performance, Not known exactly where Kecak dance originated and which was first developed, but there are some kind of agreement on the Balinese Kecak was first developed into a performing arts in the village of Bona, Gianyar, as additional knowledge Kecak was originally a song or music that is resultant from a combination sounds that make up melodies that are usually used to accompany the sacred dance Sanghyang. And can only be staged in the temple. Then in the early 1930s by artists from the village of Bona, Gianyar trying to develop a Kecak dance by taking the story of Ramayana who danced as a substitute for Sanghyang Dance so this dance could eventually be displayed in public as a performance art. Part of the Ramayana story in which the first is taken as Goddess Sita was abducted by King Ravana. Kecak Dance in Bali continues to change and progress since the 1970's. Developments can be seen is in terms of story and staging. In terms of the story for staging not only sticking to one part of the Ramayana, but also other parts of the story of the Ramayana. Then in terms of staging also began to experience growth not only found in one place likes the Village Bona, Gianyar, but also other villages in Bali began to develop Kecak dance so all regions in Bali there are dozens of Kecak groups whose members are usually members of the Banjar. 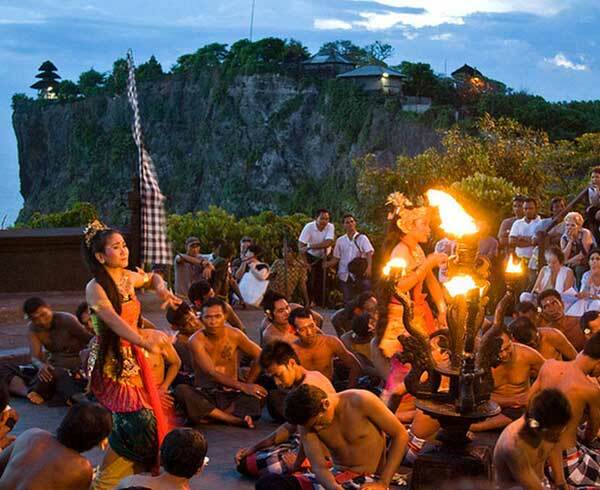 Activities such as Kecak dance festival is often held in Bali well by government or by a school of art in Bali. As well as from the amount of much dancers who ever performed in the Kecak dance was recorded in 1979 which involved 500 dancers. At that time kecak performed by taking the story from the Mahabharata. But this record was broken by Tabanan regency government that organizes colossal Kecak dance with 5000 dancers on September 29, 2006, at Tanah Lot, Tabanan, Bali. 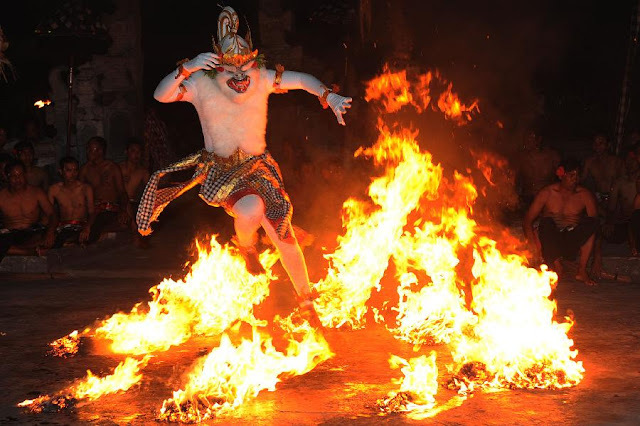 As a Kecak dance performance is supported by some very important factor, and in the Kecak dance performance presents the dance as an introduction to the story, of course, vital music to accompany the dancers movements. But in the Kecak Dance, the music generated from a combination sounds of members "cak" which were about 50-70 people all of them will make music in akapela. A person will act as a leader who gives the tone early, someone else acting as a suppressor in charge of pressure high or low tone, someone else acting as a solo singer, and someone else will act as the mastermind behind that to deliver the story. The dancers in the Kecak dance motion should not follow the movement of dance accompanied with gamelan. So in the Kecak dancethis gestures of the dancer is more relaxed because the main priority is the storyline and the sound mix. Bali Golden Tour What makes the Kecak special is that the accompanying music is provided by the human voice, the gamelan suara, a choir of a hundred men or more sitting in concentric circles, swaying, standing up, lying prone as the story develops. The story is a fragment from the Ramayana, the Hindu epic which finds its expression in many forms, not only in dance, but also in painting and carving. Prince Rama, heir to the throne of the kingdom of Ayodya, and his wife Sita have been banished from the kingdom by King Dasarata as a result of trickery by Rama's stepmother. The story begins with the arrival of Rama and Sita accompanied by Rama's brother Laksmana in the forest of Dandaka. The trio have been observed by the demon Rahwana, King of Alengka, who lusts after the beautiful Sita. Rahwana sends his prime minister Marica to try and isolate Sita so that Rahwana can kidnap her. Marica's magical powers turn him into a golden deer and he enters the forest and when the Sita sees the golden deer she is so enchanted by it that she asks Rama to capture it for her. Rama chases after the deer leaving his brother Laksamana behind with strict instuction to protec Sita. When Sita thinks she hears a cry for help from Rama she forces Laksamana to go after Rama by accusing him of cowardice and he goes off to help Rama with great reluctance after drawing a magic circle on the ground and telling Sita the she should not under any circumstance step out side the circle. Sita, left alone in the forest becomes an easy prey to the trickery of Rahwana who has disguised himself has an old periest and bags Sita for some food as he is cold and hungry. Sita falls for for his trick, she steps outside the circle to give the old priest some food and rahwana grabs her and takes her to his palace.Once back in his palace in Alengka, Rahwana tries everything he can to seduce Sita without any luck. In the palace of Alengka, Sita pours out her heart about her cruel fate to Rahwana's niece Trijata, when Hanoman appears telling her that hi is Rama's envoy and proving it by showing her Rama's ring. Sita gives Hanoman a hairpin to show she is still alive and sand him back to Rama with a massage to come to her rescue. In the meantime Rama and Laksamana accompanied by Tualen are wandering in the forest looking for Sita when Meganada, Rahwana's son, appeares and engages Rama and Laksamana in Battle. Meganada uses his magic powers and shoots of an arrow which magically turns in to a dragon which overpowers Rama and Laksamana and they are trussed up in ropes. The bird Garuda, King of all the bird, a good friend of King Dasarata, has observed trouble Rama is in from high up in the sky and comes to the rescue freeing the brothers from the ropes. Rama and Laksamana continue on their way to rescue Sita and are joined by Sugriwa, king of the monkeyes, and his monkeys army. This fragmen of the Ramayana come to an end with the bittle between Sugriwa and his Monkeys Army and Meganada and his Demon Army which ends with the defeat of Meganada.